Albion lost their final pre-season friendly 3-2 to Spanish giants Atletico Madrid before they begin their Premier League campaign next weekend. Here's six things we learned from the game. For the first of many occasions this season, a team filled with international superstars were on show at the Amex. 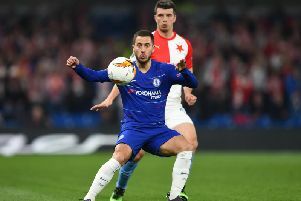 The visitors included French international Antoine Griezmann, Spanish internationals Koke, Juanfran and Fernando Torres and Belgium star Yannick Carrasco among their starters. While Griezmann was kept quiet for much of the match, Carrasco was a danger throughout and Torres netted Atletico's second. The visit of the La Liga giants certainly whets the appetite for the start of the Premier League season next weekend, when Manchester City head to the Amex. The match was the last competitive action for Albion's players to stake their claim to be in the starting line-up for next weekend's Premier League opener. There were a number of encouraging performances, with Chelsea loanee Izzy Brown impressing down the left as he worked hard up and down the pitch. Solly March made an immediate impact after coming on at the break and fired just over early in the second period before he set up Albion's second equaliser. Pascal Gross again looked a threat in the attacking midfield role and produced a couple of lovely pieces of skill, while he netted Albion's first leveller with a deflected free kick. Steve Sidwell's experience will be a big factor for the squad on and off the pitch this season and the midfielder did his chances of starting against Manchester City no harm with a solid second half performance. His header drew Albion level at 2-2, before Atletico struck late on to win 3-2. With so much money being spent at the top end of the Premier League this summer, Albion's acquistion of Pascal Gross has gone under the radar. The attacking midfielder joined from Ingolstadt after creating the most chances in the Bundesliga in the past two seasons. He had already impressed in the earlier pre-season fixtures and again looked dangerous going forward. There may have been an element of fortune to his deflected free kick equaliser but it was nothing less than he deserved. At 2-2, he also whistled a shot just past the post from 22 yards. On his early showings, he will be a big player for Albion this season. New goalkeeper Mathew Ryan made a promising start to his Albion home career with a string of saves, before a moment he'll want to forget just before the break. There appeared little danger when Nicolas Gaitan lined up to shoot from 25 yards but his speculative effort slipped through the fingers of Brighton's Australian shot-stopper and rolled into the back of the net. Ryan had no chance with Fernando Torres's header as the striker was left unmarked to head home from just six yards or Lucas Hernandez's late winner - shortly after making a superb save to deny Antoine Griezmann. There was a welcome sight for Albion fans when the team news was revealed, with star winger Anthony Knockaert named as one of the substitutes. Brighton's player of the season last year was forced off with an ankle injury after just ten minutes of the opening pre-season friendly against Fortuna Dusseldorf last month and had been ruled touch-and-go to make the season-opener against Manchester City. There was a loud cheer whenever Knockaert went to warm-up and he came on to a huge cheer with 19 minutes to go. Albion will need their star man to be on top form this season as they bid to stay in the Premier League. A sell-out crowd of 27,343 for a pre-season friendly shows just how far Albion have come. Just 20 years ago, Brighton stayed in the Football League by the skin of their teeth and today one of the top clubs in European football were on show at the Amex. While Atletico dominated much of the possession, Albion made the most of when they had the ball to score twice against a team who will be targeting the La Liga and Champions League titles next season. Brighton's priority will be maintaining their Premier League status but this performance will give them a lot of confidence and hope heading into the opening game of the season.